Farmington real estate, located in Fulton County, Illinois is west of Peoria and Bloomington. It is to the north of Canton and Lewiston and east of Macomb and Galesburg. The city has a population of 2,514 people and is one of the more historic areas of the country due to the abundance of pre-World War II architecture. Farmington is a part of the wider Peoria Consolidated Statistical Area. The city is home to many young professionals, families with children and retirees. Farmington homes for sale include many that were built prior to 1939 as well as some that were constructed between 1940 and 1969 and from 1970 to 1994. New construction is present as well. Farmington was founded approximately in the mid-19th century after being inhabited by the Native Americans of the Potawatomi tribe. 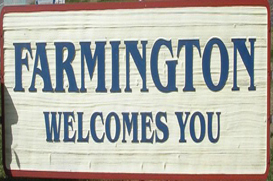 The city was named after Farmington, Connecticut. When first inhabited, two frontiersmen came onto the land and built crude, but manageable log cabins to survive the elements. When the the winter came onto the land, the settlers grew sick and weary. The Native Americans grew friendly towards the settlers and gave them treatments for their illnesses and help when female settlers were giving birth. During the American Civil War, Farmington participated in the Underground Railroad. During the disguise of night, runaway slaves avoided capture by the use of those who believed in their freedom. There were some who used their own homes to hide runaways, so they can seek freedom. Today, some of those houses that were used in the Underground Railroad are still standing. Residents of Farmington real estate are served by the Farmington Central CUSD 265 School District. This district has 3 schools with an enrollment of approximately 1,469 students. Fulton County is named for Robert Fulton, who invented the steamboat. The county was originally a part of Pike County until its formation in 1823. Residents of Farmington real estate, as a part of Fulton County enjoy the annual Spoon River Scenic Drive, which occurs during the first two weekends of October. This event has been a tradition since 1968 and attracts thousands of people from all areas of the country. The Spoon River is a tributary of the Illinois River and is 147 miles long. It was the inspiration for the 1916 poetry written by Edgar Lee Masters, named The Spoon River Anthology. In addition, living in Farmington provides a variety of other recreational opportunities including the Dickson Mounds Museum. This is a state museum chronicling the daily life of the Native Americans who lived in the Illinois River Valley. The location, which is 21 miles from Peoria also provides residents with numerous entertainment, recreation and job opportunities. Located in adjacent Peoria County, there are museums, a zoo, the ballet and symphony. It is the location of Caterpillar, Inc. and a truck manufacturing division of Komatsu American Corporation. One-fourth of the economy in Peoria is supported by healthcare, which is another career possibility for residents of this area. As a choice for a primary home or an investment, Farmington real estate is an attractive option.